Today is the second Memory Lane Friday and the topic is a memory of a pet growing up. I had many to choose from. Our beloved pug, Butch. A pet frog I raised from a tadpole named Gilly. A pony named Shorty. But I didn't choose any of those. Instead, I picked the one pet that I felt was truly mine growing up. When I was about 12, I was riding bikes with my friend Nicole. We were riding down the back alleys that ran behind houses and I found an old bird cage that someone had thrown out with the trash. Ever the rummager, I took it back to the house and cleaned it up. 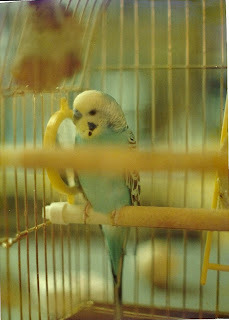 My Dad had told me stories of his pet parakeet, Tuffy, and I loved the name. So when I got my own parakeet I named him Tuffy, Jr.
Tuffy was cool. He would hang out on my shoulder or perch on my finger for hours. His best trick was his equestrian talent. Growing up, my life centered around horses and riding, so one of my favorite toys was the Playmobil horse show set. I had a Jeep and trailer, horses with blankets, and lots of jumps. I couldn't find a picture of the exact set, since this was some 20 years ago, but this will give you an idea. I would set up all the little jumps in a row, and Tuffy would go jump jump jump right over all of them. Tuffy could also say a few phrases, like "Pretty Bird". He turned out to be a really great pet for a preteen. Want to join in on Memory Lane Friday? It's easy! Just copy the code underneath the button and paste it into your blog. After you blog, come back and enter your website into Mr. Linky. Then leave some comments for the other participants. That's all! Next week's topic is 'A Sporting Event'. Your dad and I thought your pet post would be about Chico or Butch. We never dreamed it would be Tuffy. I remember how Tuffy just pined away until he died after you went off to college. He was a very great bird! Tuffy is a cute name! I have a parakeet as well, her name is Nila and she's so blue and pretty. I have been wondering how to teach her to talk. She sings all the time! I enjoyed reading about your pet memory! Cute post and pics! I joined you today!